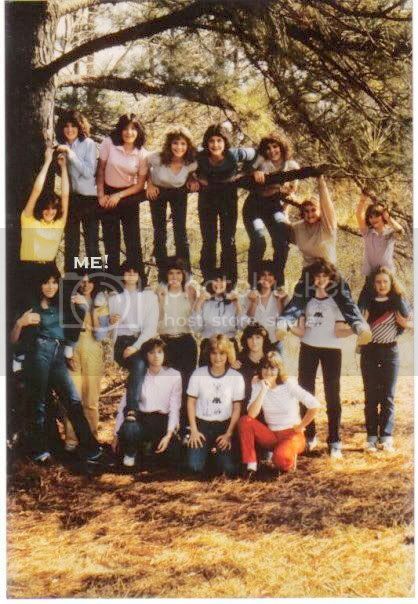 Do you remember the names of all the girls in the photos? I think I see Anja Aloia and Jody Sale, but I didn't remember them being cheerleaders. Just so you know... Mary and I have been friends since third grade. We went to Riverdale Elementary, Riverdale Jr. High and Riverdale Sr. High together. We were in a lot of the same classes. She played basketball... I was a cheerleader... and when I stopped cheering, I was manager for the basketball team. So we grew up with a lot of the same friends. Whew! We were numbered and every time we would line up we'd have to get in number order. That's how she kept up with us. Every piece of uniform and equipment we had listed our number. As Miss Butler said, "To the rest of the school they were one group of twenty, to me they were twenty groups of one. Remember the faces, remember the names, they all achieved fame." Good times! Love the blast from the past. I would love to find that JV Basketball picture that has Mary in her jock suit and me looking all delicate and girly in my trendy eighties stuff. That's okay, you don't have to find that picture (really, please, no) . . . and who I thought was Jodie Sale was Kim Kight . . . and the one I thought was Anja was Sheila (?). I do have a few pictures from a Myrtle Beach trip . . . I might can actually put my hands on those . . . I have a FB friend request from an Angela Nunnally . . . gosh, her face looks familiar, but I can't place her. Nunnally is her married name, I don't know her maiden name . . . she's one of AT's friends ~ look at her picture and see if you remember who it is . . . I'm meeting up with Traci McGregor Williams Saturday in Carrollton! I'm so excited! She was always so sweet! Feel better today . . .
PS/And I'm so coming to Helen soon!